The tree is also called the Toothache Tree or Tickle Tongue Tree, because the bark and leaves contain a chemical compound that produces a numbing sensation in the mouth. Native Americans and early settlers used the leaves as a remedy for toothaches, and mothers would rub their baby’s gums with the leaves to soothe the pain of teething. Hercules Club trees produce purple berries in summer that attract birds. In turn, the birds distribute the seeds, which tend to flourish in sunny, isolated locations where they can grow without much competition. The Hercules Club tree is a native member of the citrus family, and like other members of this family, it is a preferred food for caterpillars of the Giant Swallowtail butterfly. 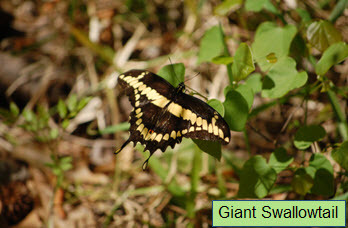 During the summer, you may see a large black and yellow butterfly hovering around the leaves of the tree, touching her abdomen to the leaves – she is laying eggs that will turn into caterpillars and then eventually into butterflies.